The Little Universe is a technothiller that's simultaneously entertaining and profound. When Webster Adams creatures a miniature, accelerated universe that evolves in ways he never could have imagined, he begins to question the idea of creation and our roles in our own universe. If you've been looking for a story that's exciting, original, and impossible to put down, you've found it. Grab your copy today! Description: What if you could create a universe - a miniature self-enclosed universe? Imagine having probing cameras that could focus to any star or planet looking for life. And once you found life, what if you could accelerate time and watch it evolve? What might you find? Primordial soup. Strange beings. Alien societies. Profound wisdom. Webster Adams, astronomer, inventor, and Jon's latest client, performs such an experiment. To Webster's amazement, he finds planets and cultures beyond his wildest dreams. His little universe turns into a discovery machine - an overnight goldmine. He and his crew observe societies that evolve so far past them on levels of technology and spirituality, that the world will be forever changed. Webster's lovely daughter, Whitney, also overwhelms Jon. She opens his eyes to the deeper meanings within the experiment - to the divine nature and connectedness of all life, by finding the most advanced beings within the project - the spirit guides from Theta 7. Reviews: "The Little Universe is one of those rare books, light enough on the surface to be a fun summer read, but deep enough to keep you thinking about it long after you've turned the last page. The story is absolutely fascinating, one of my new favorite science fiction books." 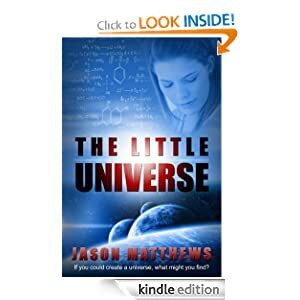 Get your copy of The Little Universe now! Healing by Touch? Can We All Do It?